“Similar to our computers which handle electrons to perform the calculations and logics, all the circuitry in living beings is based on the transport of ions, such as sodium, chloride, calcium, etc. Nature exploits incredibly subtle transport of these elementary charges and an artillery of ion channels to perform advanced functions by manipulating the - often exotic - behaviour of ion transport at molecular scales. Achieving such features in artificial channels remains a considerable challenge. As published in Nature, Researchers from the Micromegas team at the Physics Department at ENS, Paris in collaboration with the Condensed Matter Physics laboratory and National Graphene Institute at The University of Manchester, have been able to highlight mechano-sensitive properties of ion transport in few angstroms thick artificial channels. Just over two years ago, Manchester researchers led by Dr Radha Boya and Prof Sir Andre Geim showed that by stacking two-dimensional atomic layers similar to stacking bricks of Lego, it is indeed possible to assemble molecular and smooth channels at the atomic scale in a controlled manner. 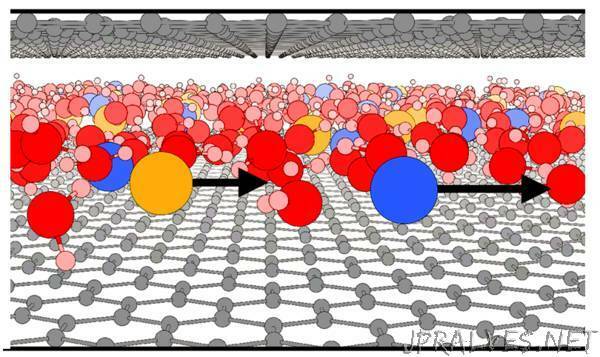 The atomic layers used for building the channel are held together by so-called van der Waals forces. Using these channels, the new experiments show that considerable ionic current can be generated when a flow is induced by applying a pressure difference. Separating two miniature baths of salt solutions, these angstrom scale channels generate ionic current when water molecules are mechanically pushed through them. Dr Timothée Mouterde, the first author of this study, said: “Even more surprising, by applying an electric field along with pressure, this flow current can be modulated extremely sensitively”. This new platform will allow exploring the physical mechanisms of these extreme confinement situations at work in living systems, and in the longer term, to mimic elementary calculus functions based on ion transport. Prof Lydéric Bocquet adds: “This novel effect is akin to transistor but here for ion transport and can be understood as gating of mechanical ion flow by voltage”. Furthermore interestingly, the electronic properties of the confining wall materials of the channel seem to influence this ‘voltage gating’. This effect can be understood by differential friction of water and ions on the walls at these molecular scales”. Dr Ashok Keerthi, who is a co-author said: “Inside our artificial channels which are only couple of water atoms thick, water and ions are organized in a two-dimensional monolayer. The ability to make such precise angstrom scale channels has provided us with tools to explore anomalous properties of water and flows”.